. : Brian Suke :: Ski XCOttawa.ca :: Skiing in Ottawa and Gatineau Park :. Brian is our team rookie - and thus will be carrying the wax boxes all winter. I'm serious. Brian comes to us all the way from Tobermory, right on the tip of the Bruce peninsula. He started skiing in high school, mostly so he could hunt a bit easier in the winter- but then he started passing all the moose, and one of them told him he should try racing. Brian went to Guelph, where he proudly wore the black-and-white cowsuit of the Guelph Nordic team, and finished a degree in biological science. 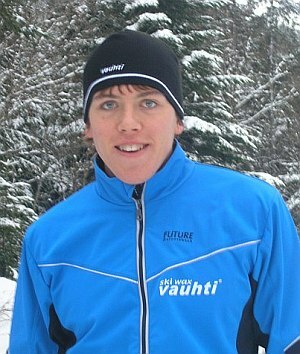 His best result in the Ontario University Champs was a 3rd in 2005 in the 10k skate, and he was named the Southern Ontario District skier of the year in 2006. When he finished his degree, he decided that the ONLY place for him was, naturally, with XC Ottawa, so he moved to Ottawa with his girlfriend Judy, who will be our team doctor in 5 years when she finishes med school. Brian works in the market as an apprentice chef at a quality restaurant - so if you're ever eating stuffed eggplant flambé and it's shaped a bit like a skier, you know Brian made it for you. Performance Goals: Achieve top 30 ranking within Canada. Other Pursuits: Cooking, fishing, marathon canoeing and cycling.